Nelson Mandela is portrayed as a solitary leader who rose above his people, instead of being part of a liberation movement. Images: (l) Nelson Mandela and friends sing ‘Nikosi Sikelel I Afrika’ at the end of their trial for treason in South Africa, 3/29/61. (r) Image from the picture book Mandela. Mandela, the beautifully illustrated children’s book by Kadir Nelson, has been selected as one of the top books on Nelson Mandela by many groups including Colorlines and Kirkus Reviews. 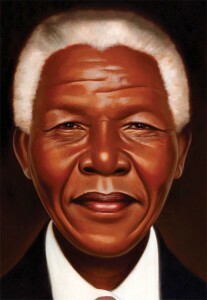 Given Kadir Nelson’s talents and strong reputation as a children’s book author and illustrator, Mandela is likely to become a staple in libraries and classrooms. One look at the cover and it is easy to see why the book is so popular. Kadir Nelson’s illustrations are stunning and the world is tuned into Mandela with his recent passing and the release of the film, Mandela: The Long Walk to Freedom. Unfortunately, this picture book presents the same mythological image of Mandela that has been the norm on the mainstream news. As journalist Bob Herbert lamented, the news media have reduced Mandela to a “lovable, platitudinous cardboard character,” and the vital role of the anti-apartheid struggle is effectively obscured in the process. The mythmaking in Mandela begins with the book jacket: “Mandela saw fellow Africans who were poor and powerless. He decided he would work to protect them.” The text repeats this image of Mandela-the-savior: “Africans were poor and powerless. Nelson became a lawyer and defended those who could not defend themselves.” There is no reference to the fact that Mandela joined a movement. As Mandela himself noted, “No single person can liberate a country. You can only liberate a country if you act as a collective.” And Mandela could not have launched the African National Congress (ANC) since that was founded in 1912, six years before he was born. There is little indication in the book that the resistance to European colonization and white supremacy has a long history, dating back as far as the early 1500s, when African cattlekeepers defeated Portuguese invaders. The brutality of the apartheid regime does not need to be depicted in a book for young children, but it would be age appropriate to explain that black people in South Africa did not have equal access to education, jobs, land, and physical safety. These are all familiar to children; the concept of fairness is also understood at a young age. It would make a lot more sense to children that Mandela and others went to jail for decades to address core life needs rather than for the privilege of sunbathing with whites. Similarly, the anti-apartheid movement is presented as solely focused on racial harmony. For example, the book notes that Mandela traveled to “free nations where black Liberians, Ethiopians, and Moroccans freely conversed with white Europeans and brown Egyptians. They shook hands—a glimpse of freedom for life at home. Nelson returned to South Africa to cleanse his homeland of hate and discrimination.” Actually, Mandela travelled to other countries to build support for the resistance movement. Asking others for help and solidarity are concepts young children can understand. 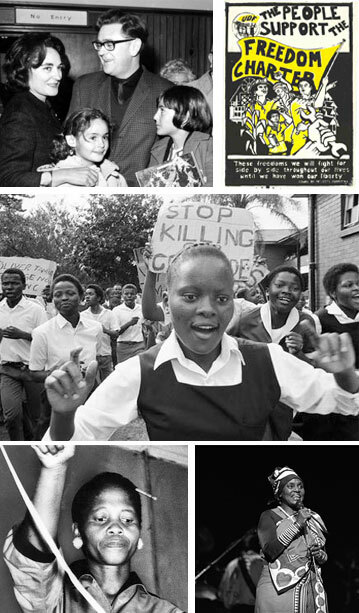 The movement for liberation was widespread, including people and initiatives such as (from top left) Ruth First, Joe Slovo, the Freedom Charter, thousands of children like themselves, Lillian Ngoyi, and Miriam Makeba. Not only will this leave children confused about the current struggles in South Africa, it also misleads them about any social movement. There are milestones and victories, but the struggle to make the world a better place is ongoing. This is especially true in South Africa where the end of apartheid was by no means the end of economic exploitation and inequality. The happy ending mirrors the dominant narrative about the Civil Rights Movement in the United States: When legal segregation ended, victory was achieved. Students do not learn about the Dr. Martin Luther King Jr. and other Civil Rights Movement activists’ stands against the war and for economic justice, nor are children informed that the anti-apartheid struggle was for economic justice and a vision of a new society as outlined in the Freedom Charter. (4) the intellectual capacity of young readers to understand injustice and to appreciate the value of people working together for change. What do children learn from reading Mandela? That black Africans suffered for centuries because they could not go to white beaches and that they were hopeless until Mandela came along. Mandela was all powerful and (reinforcing an all too familiar stereotype) Africans are poor and need to be rescued. Some will say: “But this is a book for young children. They’ll learn the true story later.” Here’s the problem. Ask any adult to tell you about activists in the Civil Rights Movement or the struggles of the United Farmworkers. Most likely they’ll recite the same few names they learned from picture books in kindergarten and have learned every year since. Not only have they learned to name Rosa Parks, Martin Luther King, and Cesar Chavez—they have learned that those people were omni-potent and that no one else mattered. The same will be true with Mandela. If we don’t address the myth-making in children’s books, his image will be used to avoid the many lessons that can be learned from Nelson Mandela’s life, intellect, commitment, bravery, and humanity as part of a collective struggle. 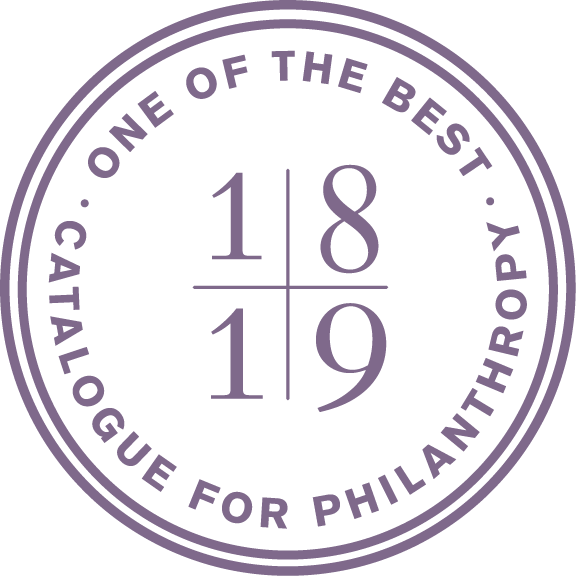 I hope that future editions of this book and new books about Mandela will draw on the rich stories in his life to inspire and inform young readers. This would be a real tribute to his legacy. 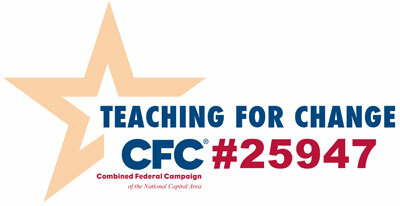 Deborah Menkart is the executive director of Teaching for Change. For reprint permission, contact Rethinking Schools. 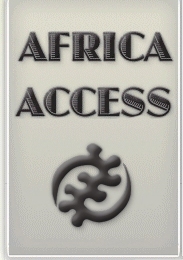 Africa Access Review was founded in 1989 to help schools, public libraries, and parents improve the quality of their children’s collection on Africa. Africa Access offers an online database with reviews of children’s books on Africa and hosts the annual Children’s Africana Book Awards. 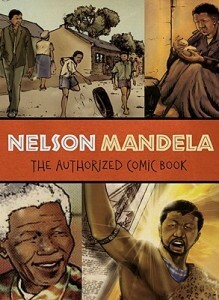 Books and films for teaching about South Africa, listed on the Zinn Education Project website, including Nelson Mandela: The Authorized Comic Book, Strangers in Their Own Country: A Curriculum Guide On South Africa, the film Have You Heard From Johannesburg, and more. The Politics of Children’s Literature: What’s Wrong with the Rosa Parks Myth offers a critical analysis that challenges the myths in children’s books about Rosa Parks and the Montgomery Bus Boycott. This article from Rethinking Schools by Herbert Kohl surfaces issues that are similar to the concerns about the mainstream press and children’s book representation of Nelson Mandela.